mester; 2) 3 - 13 weeks later; and 3) 1 hr later, following a psychophysiological assessment session. tion of the screening questionnaire, to identify participants who no longer meet criteria for inclusion. (Knowles, Coker, Scott, Cook, & Neville, 1996; Windle, 1954). sizes, and increased error in the data (Knowles et al., 1996). T. E. SPENCE ET AL. of worry as a personality trait. Miller, Metzger, & Borkovec, 1990). was one goal of the present investigation. reliability compared with the PSWQ (r = .87 v. r = .74 - .93). of the impact of trait worry on reactivity to affective stimuli. reference to worry was included in the invitation to participants. semesters: PSWQ-A score ≤ 13.
menter error, or requested termination of the testing session. were approved by the University’s Institutional Review Board. test-retest reliability was good (r = .88, 3 - 13-week period). was strong (r = .83, 3 - 13-week period). that ranges from “0” (not at all) to “3” (nearly every day). current depressive symptomatology, within a 1-week period. (most or all of the time [5 - 7 days]). individually in sessions lasting 1 - 1.5 hr. naires prior to a 30 min acoustic startle assessment session1. All data were analyzed using IBM SPSS Statistics version 19.
significance was determined using an alpha level of .05.
and from pre-session to post-session (M = 16.82, SE = 1.12). = 4.09, p < .001.
t(37) = –2.05, p < .1, D = –2.04, d = –.33 (see Figure 1). phones were removed before the third administration of the PSWQ-A. worry (n = 9). Error bars represent the SEM. SE = 2.31), t(37) = –1.59, p > .1.
semester to determine the stability of worry several weeks later. 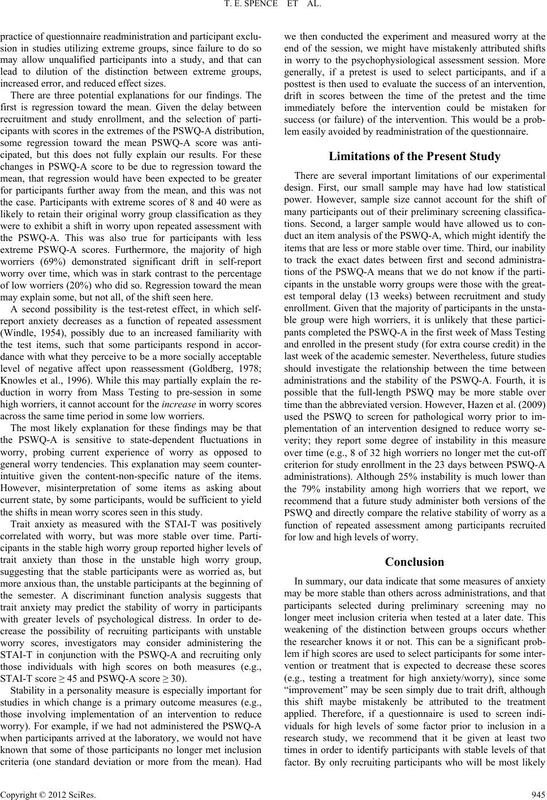 groups, the analysis was restricted to the high worry groups. variance between the stable and unstable high worry groups. are highlighted in Table 1.
reflecting differences in r values between groups determined using Fisher z-to-r transformations. being the maximum score reported in the present study). 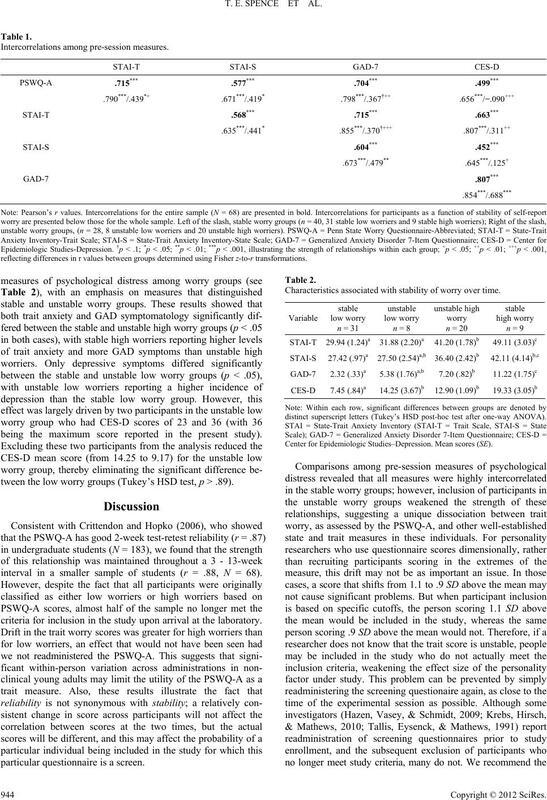 tween the low worry groups (Tukey’s HSD test, p > .89). interval in a smaller sample of students (r = .88, N = 68). criteria for inclusion in the study upon arrival at the laboratory. particular questionnaire is a screen. Characteristics associated with stability of worry over time. distinct superscript letters (Tukey’s HSD post-hoc test after one-way ANOVA). Center for Epidemiologic Studies–Depression. Mean scores (SE). increased error, and reduced effect sizes. may explain some, but not all, of the shift seen here. across the same time period in some low worriers. intuitive given the content-non-specific nature of the items. the shifts in mean worry scores seen in this study. STAI-T score ≥ 45 and PSWQ-A score ≥ 30). lem easily avoided by readministration of the questionnaire. for low and high levels of worry. sessment and treatment (pp. 5-33). Chichester: John Wiley & Sons. 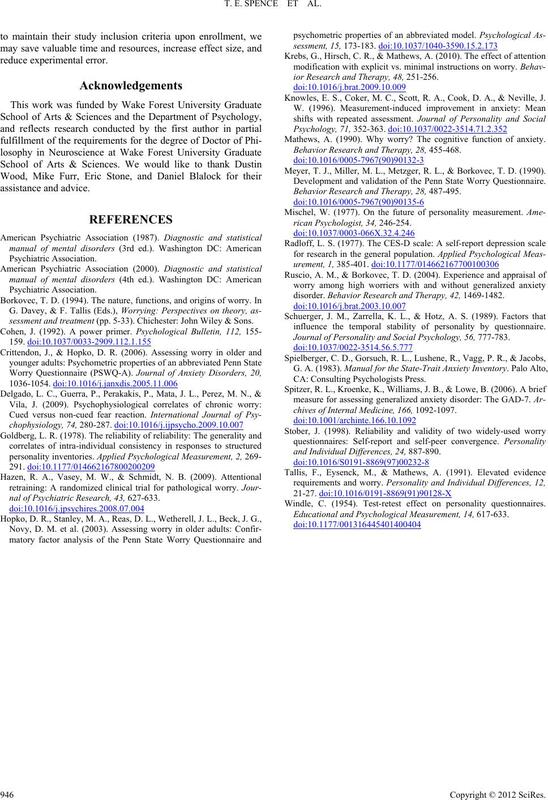 nal of Psychiatric Research , 43, 627-633.
ior Research and Therapy, 48, 251-256. Knowles, E. S., Coker, M. C., Scott, R. A., Cook, D. A., & Neville, J.
Mathews, A. (1990). Why worry? The cognitive function of anxiety. Behavior Research and Therapy, 28, 455-468. Meyer, T. J., Miller, M. L., Metzger, R. L., & Borkovec, T. D. (1990). Development and validation of the Penn State Worry Questionnaire. Behavior Research and Therapy, 28, 487-495.
disorder. Behavior Research and Thera py, 42, 1469-1482.
influence the temporal stability of personality by questionnaire. Journal of Personality and Social Psychology, 56, 777-783.
chives of Internal Medicine, 166, 1092-1097.
and Individual Differe n ces, 24, 887-890. Windle, C. (1954). Test-retest effect on personality questionnaires. Educational and Psychological Me asurement, 14, 617-633.